I like Halloween and we usually celebrate it with friends but this year this holiday coincided with an extremely busy time for me in the office so I could barely breathe – let alone organize anything during the work week. Ironically, with all that crazy work, my biggest celebration will be in the office: we did great werewolf-themed decorations; I thought of some type of costume (I will dress up as a tuxedo cat and wear Brainwave Emotion Controlled Cat Ears), cooked a dish for our traditional Halloween potluck and even drove to work after hours to put up my entry into The Best Werewolf Detection or Protection Device contest. I made a “HAVE YOU SEEN THIS CREATURE?” twin-peaks-type poster with a picture of the werewolf, a figure of which we used to decorate the office; ten posters in different parts of the office urge everybody not to approach the werewolf and contact me. 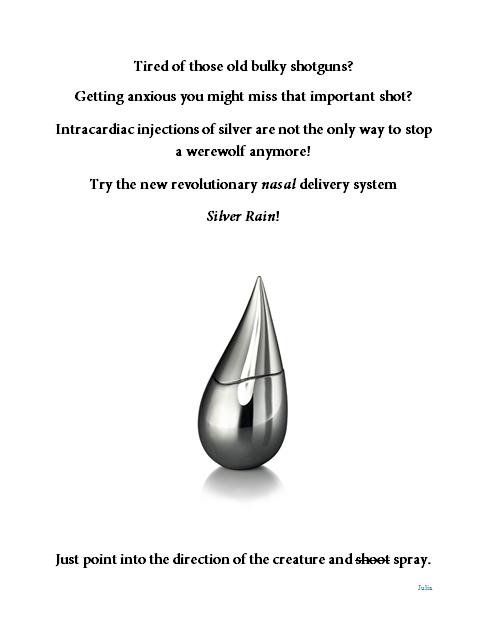 I plan to fight werewolves with silver but not by the old-fashioned intracardiac injection (a.k.a. silver bullet in the heart) but via the progressive nasal route of administration using Silver Rain by La Prairie in a beautiful drop-shaped silver bottle (I used to like this perfume and wore it for several years but not any more – so I’m glad I found some use for it). Do you do anything special this Halloween? Happy Halloween to you and Rusty. My office does nothing for Halloween. Actually the office doesn’t do much for any holiday really. At home I’d like to keep the lights off and pretend we are not home but hubby won’t let me. He’ll be passing out candy and I’ll be upstairs with the dogs. The ringing doorbell drives them nuts. I admire the creativity you put into your office decorations! I work from home, so there will be no Hallowe’en celebrations in my ‘office’. I guess I’ll stop in quietly and try to dodge the trick ‘n’ treaters. Happily my door is a little ‘tricky’ to find… Oh, I must say that Rusty looks well scary in that picture! 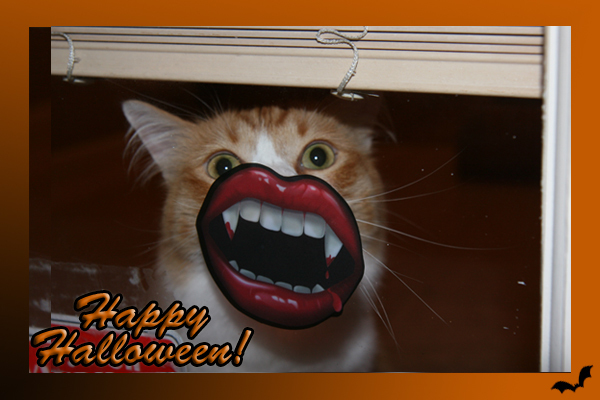 This picture of Rusty I took from outside of my door: I went out to decorate and Rusty was trying to get to those vampire lips that I put on the glass outside. Rusty looks very scary. Nothing at our office. We were told yesterday that masks were forbidden on site and that anyone wearing them would be escorted off campus. Our agency (one of many in the building) told us that Halloween will not be celebrated. When did we become so damn cranky. Tonight however, our neighbors are having a block party. I will be a prince…that seems rather fitting :) Happy Halloween! Do you celebrate any other holidays in the office? Kind of… we don’t have a Christmas party, we have a Holiday Party…so politically correct eh? We also have a holiday party (and a holiday tree :) ) but that is mostly because we do have a very multi-cultural small office. Rusty wants some bloooooooodd! Argh! No, nothing special for Halloween. We don’t celebrate it in Poland. Istead we have All Saints’ Day on Nov 1st when we visit graves of our passed relatives, decorate them with flowers and pray for them, remembering days when they were with us. Nah, Rusty wants some treat and to understand what is that strange red thingy that just appeared on his window. It’s so obvious you do not have a cat :) I’m sure Rusty thinks that everything in the house is his. But this particular window is next to the door and it starts almost from the floor level so Rusty likes to look out from it. We keep blinds up a little – so he has an unobstructed view. We had some kids turn up at the door tonight for candy as I was leaving for work. In my deepest voice I screamed “HAVE SOME CANDY GIRLS”” They screamed so loud I thought they’d faint. Then they all started laughing, took some candy and ran back up the drive. We could hear them laughing and excitedly telling Dad about their adventure. It was the first time I’ve ever been Trick or Treated but there is ALWAYS cool candy in the house so no worries. Happy Halloween, Undina! I’m glad to see that Rusty is into being Halloweenish, too. Thank you, Suzanne! It was a good potluck: not the best we ever had inthe officefor Halloween but good. Everybody was so busy recently and many people are traveling so it’s good that we could do what we did. Halloween around here focuses on my kids. We don’t really decorate the house, although I enjoy blasting my “Halloween Playlist” on my iPod, but I do pretty fabulous costumes for The Wild Things, if I do say so myself. As for myself, I am rocking standy-uppy hair, black top and skirt with orange and black striped tights, black platform lace-up boots, a purple scarf and skeleton earrings. And Avignon for the final touch. I love Halloween! My perfume for this Helloween was Ormonde Jayne Orris Noir (I just suddenly felt like that). With costumes to wearto the office it’s always a compromise between the appearance and the comfort: it’s still a full work day. And a Happy (that always feels slightly wrong) Halloween to you too. I adore the sound of those ears. Dear Dandy, do not overthink standard greetings. And thank you. My office is quite conservative and so we did not dress up today. Also, being at the corporate headquarters means we all have to be extra conscious of how we present ourselves; however the rule does not apply to the kids at our onsite childcare facilities. Although I did not see them today, I’ve seen them in previous years parading through some public spaces – cute! Oh and I love your creativity with your Silver Rain perfume! Your party sounds like fun! I actually forgot that it was Halloween until very late in the day. :) Partially it is not being in a place where there are decorations and things all over the place, and partially it is that no one I know really celebrates the holiday. If I had thought about it in time I might have painted a nose and whiskers on just for fun. I don’t want to give up Halloween! Next year …. This year it was a party in the office (I liked it). But next year, if everything’s fine, I plan to organize a real big party with our friends – since it will be on Friday. I didn’t have this holiday growing up but here I enjoy it a lot and do not want to give it up.